The Treasure Island Hotel Las Vegas has a great location on the Strip and offers good value for a mid-range priced hotel. The rooms have been remodeled in 2012 with a sleek urban décor making them some of the newest on the Strip. Treasure Island has come a long way from its pirate days but there still is a small segment left at the unique Sirens Cove which hosts a pirate ship. The entertainment includes Mystere presented by Cirque du Soleil and a fabulous Hawaiian lau’ai at Kahunaville. 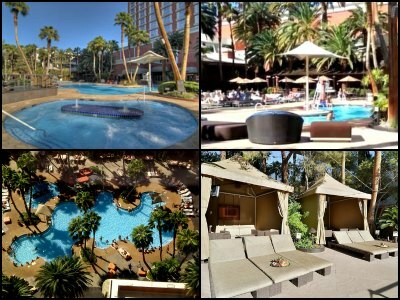 The pool area is a lush garden with fabulous cabanas and the 25 person hot tub is one of the largest in Sin City. Dining and a good old time can be found at Gilley’s Saloon as well as an incredible south of the border experience at Senor Frogs. Shopping is enhanced by the location of Treasure Island which offers easy access to the Fashion Show Mall as well as the Grand Canal Shoppes. 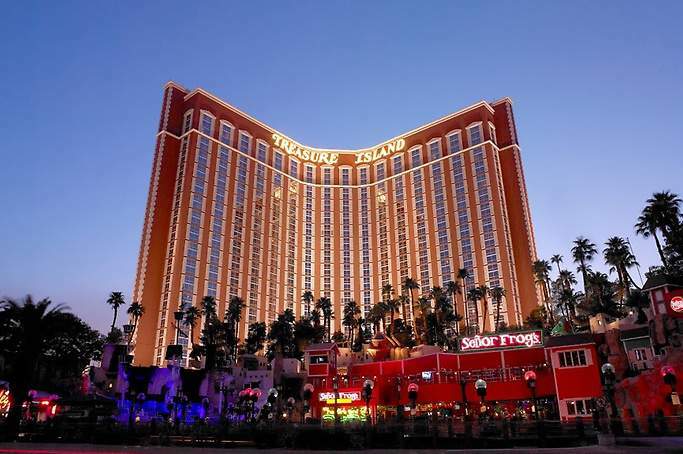 Treasure Island offers lots of good rooms and a great location to explore the excitement of Las Vegas. The Treasure Island Hotel Las Vegas has more than 2,600 rooms which were remodeled in 2012. The rooms are mid-range in price and offer a lot of value given the location on this complex. The Deluxe Rooms have a modern feeling with lots of wood, chrome and marble. These rooms are 400 square feet with a small sitting area, work desk, refrigerator, a choice of king/queen size beds and the bathroom is large with a dual sink vanity as well as a tub/shower combination. The Deluxe Room also has corner units in the main tower that have a panoramic view and Penthouse level Deluxe Rooms too as well as being available with a view of the Strip. There are six different suites offered at Treasure Island Hotel that range in size from 630 to 1,800 square feet. The modern décor varies from suite to suite and the amenities improve with each upgrade. Suites also have views of the Strip, the pool, the garden and Sirens Cove. The Petite Suite is the smallest with a studio floorplan that includes an open space with a small dining table, sitting area, king size bed, refrigerator and two full bathrooms with one having a soaking tub as well as a walk-in shower in the second. The Executive Suite at 830 square feet and the Tower Suite at 930 square feet boast a similar Petite Suite studio floorplan. The real difference is a larger living area, work area and dining area. The Luxury Suite is 1030 square feet and boasts a separate living area with a dining space, work place, refrigerator and a half bathroom off the foyer. The bedroom has a sitting area and his/hers bathrooms with one having a whirlpool tub as well as an oversized walk-in shower in the other. The Premier Suite is 1,300 square feet with a comfortable décor. The suite has a similar floorplan to the Luxury Suite with an added wet bar and more space. Patrons can also add a Deluxe Room to this unit for additional guests. The Penthouse Suite is the largest suite within the Treasure Island Hotel Las Vegas. Located on the 36th floor these suites are luxury waiting to please your senses. There are two bedrooms, two and a half bathrooms, a living room, dining room and a wet bar with plenty of seating for entertaining. The views from atop Treasure Island Hotel are spectacular with the floor to ceiling windows and the VIP amenities will be something to remember. 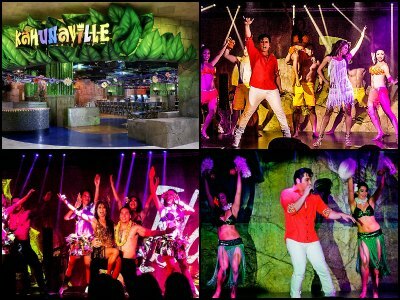 The Treasure Island Hotel Las Vegas has always strived to bring you the best in Las Vegas styled entertainment. 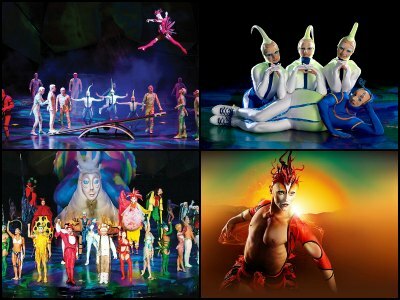 Mystere is one of the most favourable shows presented by Cirque du Soleil and is another acrobatic masterpiece by this famed creator. This show has over 75 cast members that are capable of almost anything in the air, on the ground and any place in between. The story line is unique and details the mystery of life. The dancers, acrobats, singers and musicians are some of the most talented performers in the world. This Cirque du Soleil production has received the Best Production Show award by the Las Vegas Review eight years in a row. Another standout performance awaits you at Flamingo Hotel and Casino. And it is the Island Heat at Kahunaville. Island Heat at Kahunaville is sure to please the patron that is looking for an authentic and fun lua’ai of the South Pacific. This party has everything from great food to dancing to singing all of your favorite beach songs. Cuisine specialties like Macadamia Crust Mahi Mahi and Teriyaki flank steak are just waiting to please your palette. The traditional island drinks like Pina Colada and frozen rum concoctions will ease your inhibitions as you sway to the tropical beat. There are eight great places to spend some time in when you are ready to roll. The casino bars are numerous with the most fashionable to be the High Limit Lounge. 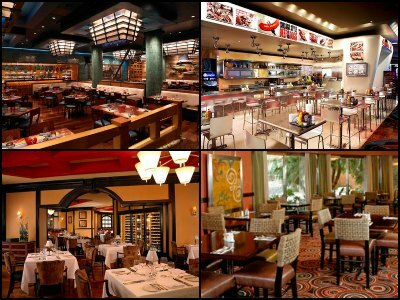 The lounge at the Steakhouse offer signature classic cocktails; the Breeze Bar offers innovative colored martinis; Viva Las Vegas Margaritas is a series of machines that make flavored margaritas and the Seafood Shack has a unique mojito bar. 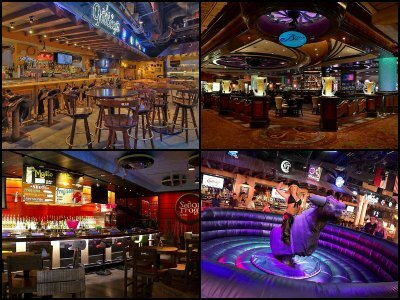 The other selections at the Treasure Island Hotel Las Vegas are the one-and-only Gilley’s Saloon which brings Texas to the Sin City; Senor Frogs offers signature drinks from south of the border and Kahunaville Party Bar takes you direct to the pleasures of the South Pacific where the party never stops. The Treasure Island Hotel Las Vegas has a bright 95,000 square foot casino with neon and interesting games. All of your standards like blackjack, roulette, baccarat and craps are offered as well as several different styles of poker. There is a high limit area and separate area for high stakes poker. 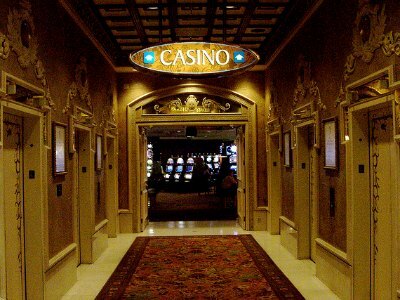 The casino offers a wide variety of slot and video poker machines that are trendy and fun to play. The race and sports book has seating for over 150 patrons and is equipped with numerous personal viewing as well as gambling stations. There are some unique restaurants and cuisine to be found at Treasure Island Hotel. On the budget side of cuisine there is the Coffee Shop which offers food 24 hours a day; Pizzeria Franceso’s bakes up fine pizza and sandwiches; Little Richie’s boasts Chicago-style hot dogs and other goodies; Pho-Vietnamese, within the Coffee Shop, for Asian delights and there is always the Buffet at Treasure Island that has Chinese, Japanese, Italian, barbeque and American classics. Casual dining includes Kahunaville for Hawaiian barbeque, seafood and steaks as well as a traditional Hawaiian lua’ai; Senor Frogs offers flavorful margaritas, burgers and Mexican cuisine and Gilley’s Saloon and Barbeque for a taste of Texas chili and ribs. On the upscale side there is Phil’s Italian Steak House where prime steaks and innovative Italian dishes will please your pallet and the Seafood Shack boasts fresh seafood with a new twist. The interior of the Buffet at Treasure Island is sleek with lots of modern décor. 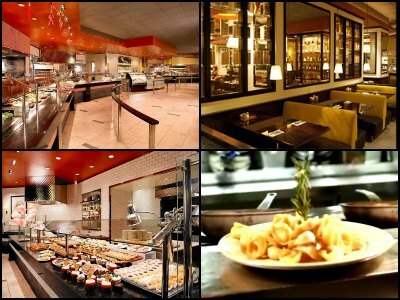 The buffet offers breakfast, lunch and dinner that will bring you taste buds to their full senses. Such delights at breakfast like made to order omelets, changes over at lunch to perhaps crepes or a taco bar. Freshly baked pastries and bread are always featured as well as a superb salad bar. The cuisine is prepared by trained chefs that use only the freshest ingredients. All of your favorites from a buffet are represented here with a new twist to spice things up a bit. Dinner on the weekends offers a special seafood selection that includes lots of king and snow crab legs. The champagne brunch on the weekends will have you ready for another exciting day in the Sin City. The lush pool area at the Treasure Island Hotel Las Vegas will remind you of being in the South Pacific. There is a big pool deck to soak up the sun with first come first serve seating. A person can indulge in food and drink poolside with service from the famous Kahunaville Party Bar. There are numerous cabanas and day beds for rent that bring the ultimate VIP experience poolside. One of the best features is the 25 person hot tub that is lively at all times. Getting married at Treasure Island Hotel Las Vegas is unique and the only place you can exchange vows on a pirate ship that is located in the Sirens Cove. Other options include the West Chapel, an intimate wedding in a small setting or perhaps you want to get married poolside. 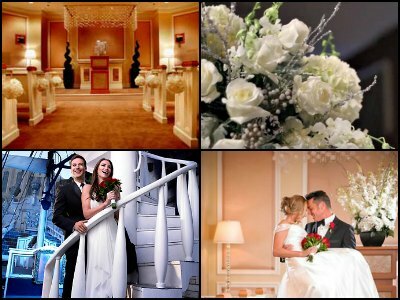 Expert wedding planners will assist you in your decisions whether you choose a package arranged by Treasure Island or if you create your own special day. Each wedding is given personal attention by the staff to ensure the day is memorable. Treasure Island Hotel brings relaxation and rejuvenation to a whole new level. The Oleksandra Spa and Salon is a virtual paradise of quality treatments that will bring your body and attitude back to life. 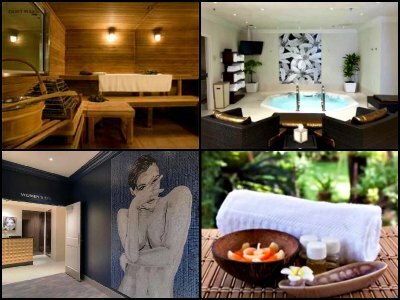 This spa is a clothing optional facility that has many packages to choose from like the hot stone massage or Swedish massage or perhaps you can enjoy the Lomi Lomi traditional Hawaiian massage. You can mix and match your massage and treatment pleasures too. The Russian Banya is exclusive to the Oleksandra Spa and Salon which is a wetter than normal hot sauna bath. There are many choices for shopping associated with Treasure Island Hotel Las Vegas. A pedestrian bridge is strategically located which leads guests to fabulous shops at the Grand Canal Shoppes within the Venetian Hotel complex and the unique Fashion Show Mall. Within the Treasure Island complex there are eleven shops that offer everything from toothpaste to diamonds. There are three Treasure Island gift shops for souvenirs as well as the Sirens Cove Shoppe; CVS is open 24 hours for all of your personal needs; the perfect wig or hair extension exists at Sizzle Me; trendy accessories wait for you at the $10 at TI; famous fragrances can be found at Perfume Eleven; there is all the memorabilia of the incredible Cirque du Soleil presentation of Mystere; fashionable swimwear is available poolside at 100 Degrees and there are interesting items at Gilley’s Trading Post and Senor Frogs.